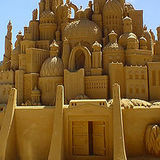 Sandcastle building is a lot of fun and entering your creation into a competition can be a great way to earn a little extra holiday cash. Why not use this summer to perfect your sandcastle building techniques? Every builder needs the right tools and you should be able to find yours around the house. Stock up on kitchen knives, paint scrapers, spray bottles and paintbrushes, and invest in a sturdy plastic spade and buckets of various shapes and sizes. The key to a good sandcastle is in picking the right place to build. You want a spot where the sand is wet, but not too close to the water. The professionals say that you know the sand is good if it stays together when you roll it around in your palm. Onto the construction. Start by creating a densely packed block of sand and then carve your castle from that. Take your time and add water if the sand is drying out. Once you've reached your desired size, you can start adding the details with your tools. A kitchen knife can be used to whittle, the paint scraper for flattening walls and the paintbrush for smoothing things away. The spray bottle will keep your sand moist during this fiddly process. Finally, use your surroundings for decoration. Shells, seaweed, driftwood, pebbles and anything else you can find can be used as adornments. Once you've perfected the castle, you can move on to more elaborate sculptures like these.